Description: This tutorial is an introduction to IoT devices and the usage of the UltraLight 2.0 Protocol for constrained devices. The tutorial introduces a series of dummy IoT devices which are displayed within the browser and allows a user to interact with them. A complete understanding of all the terms and concepts defined in this tutorial is necessary before proceeding to connect the IoT devices to the Orion Context Broker via a real IoT Agent. The Internet of Things (IoT) is a network of physical devices which are able to connect to a network and exchange data. Each "thing" or "smart device" is a gadget with embedded electronics and software which can act as a sensor or actuator. Sensors are able to report the state of the real-world around them. Actuators are responsible for altering the state of the system, by responding to a control signal. Each device is uniquely identifiable through its embedded computing system but is able to inter-operate within the existing internet infrastructure. FIWARE is a system for managing context information. For a smart solution based on the internet of Things, the context is provided by the array of attached IoT devices. Since each IoT device is a physical object which exists in the real world, it will eventually be represented as a unique entity within the context. A Smart Lamp can be switched on or off remotely. It can also report on its current state (ON or OFF). When switched on, a Motion Sensor within the device checks to see if light is needed and will dim if no-one is nearby. Furthermore the device can be report on the current luminosity of the bulb. As you can see, the Bell is an example of a pure actuator, as it only reacts to the given commands. Meanwhile the Motion Sensor is an example of a pure sensor, since it will only report on the state of the world as it sees it. The other two devices are able to both respond to commands and report on state in a meaningful way. UltraLight 2.0 is a lightweight text based protocol for constrained devices and communications where bandwidth and device memory resources are limited. The payload for measurement requests is a list of key-value pairs separated by the pipe | character. Contains two attributes, one named "t" with value "15" and another named "k" with value "abc" are transmitted. Values in Ultralight 2.0 are not typed (everything is treated as a string). Ultralight 2.0 defines a payload describing measures and commands to share between devices and servers but, does not specify a single transport protocol. Instead, different transport protocol bindings (such as HTTP, MQTT and AMQP) can be used for different scenarios. For this tutorial we will be using HTTP as a transport protocol. HTTP requests generated by the from the Context Broker and passed downwards towards an IoT device (via an IoT agent) are known as southbound traffic. Southbound traffic consists of commands made to actuator devices which alter the state of the real world by their actions. For example a command to alter the state of a lamp to ON would switch on the lamp in real life. This in turn could alter the readings of other sensors nearby. Setting up the southbound communication between an IoT Agent and IoT devices is known as provisioning. This ensures that the IoT Agent holds sufficient information to be able to contact each IoT device. In other words it knows where to send commands and which commands are supported. In order to send a command to a device, the IoT Agent sends a POST request to the endpoint supplied by the device. The body of the POST request holds the command. Will tell a device "I am known as id="urn:ngsi-ld:Robot:001" within the Context Broker. I would like the device listening on this endpoint to perform the turn command. I have supplied the parameters left and '30 (degrees) as required for the device to be able to perform the maneuver". Which is saying "I have complied with a request from the entity known as id="urn:ngsi-ld:Robot:001" within the Context Broker. The command I have performed was a turn command. The result was Turn ok". As you can see, because the Southbound command defines the id used within the interaction, and the same data is also returned, every response can always be associated to the appropriate entity held within the Context Broker. Push commands can only be used if the device is able to supply a separate endpoint for listening to southbound traffic, an alternative polling mechanism can be used when all interactions are initiated from the device itself, but this is beyond the scope of this tutorial. t (timestamp): Timestamp of the measure. Will override the automatic IoT Agent timestamp (optional). The i and k parameters are mandatory. Would indicate that the device id=motion001 wishes to inform the IoT Agent that is has made a real-world measurement c with the value 12. This would eventually be passed up into the Context Broker. Once again the i and k parameters are mandatory. The demo application will only make use of a single custom component acting as a set of dummy IoT devices. Every IoT device will be using the UltraLight 2.0 protocol running over HTTP. Since all interactions are initiated by HTTP requests, the entities can be containerized and run from exposed ports. When describing the messages being passed through a working smart solution we will refer to two further components which are not used in this tutorial, but will be needed to complete the system subsequently. An IoT Agent acts as a middleware component converting NGSI requests (from the context broker) into a protocol (such as UltraLight 2.0) usable by the IoT devices themselves. It is therefore necessary to understand a sample device protocol first, and comprehend how messages are passed through the system to subsequently understand the purpose of the IoT Agent middleware. In this tutorial you will be playing the role of an IoT Agent making commands to devices and receiving measurements from them. Within this tutorial you will be playing the role of the missing IoT Agent component, making Southbound commands to the attached IoT devices and receiving Northbound measurements as the environment changes within the store. All the commands are made as HTTP POST requests using Ultralight syntax and therefore are very simple. It is worthwhile keeping an eye on the device monitor page as it shows all the Northbound traffic generated by the devices themselves. A Bell is an example of an actuator. It can respond to commands, but the device does not supply any measurements from the real world. This example shows how a real IoT Agent would send commands to an actuator. The Bell has supplied an endpoint /iot/bell001 where it is listening for commands. The body of the request is in Ultralight syntax and consists of the id of the device (urn:ngsi-ld:Bell:001) as held in the Context Broker and the name of the command (ring) to invoke on the device. The response returns the command and the result of the action. If you are viewing the device monitor page, you can see the state of the bell change. Measurements will be sent to the IoT Agent as the state and/or luminosity changes. This example shows how a real IoT Agent would send an Ultralight command to a Smart Lamp to switch it on. The Smart Lamp has already supplied an endpoint /iot/lamp001 where it is listening for commands. The body of the request consists of the id of the device (urn:ngsi-ld:Lamp:001) as held in the Context Broker and the name of the command (on) to invoke on the device. Once the lamp is switched on the luminosity level will alter dependent upon whether the internal motion sensor detects movement. The measurement is actively reported and requests to the IoT Broker can be seen on the device monitor page. 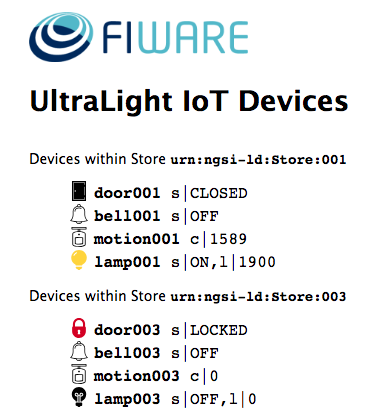 This example shows how a real IoT Agent would send an Ultralight command to a Smart Lamp to switch it off. The Smart Lamp has already supplied an endpoint /iot/lamp001 where it is listening for commands. The body of the request consists of the id of the device (urn:ngsi-ld:Lamp:001) as held in the Context Broker and the name of the command (off) to invoke on the device. Once the lamp is switched off the luminosity level does not alter. The latest Ultralight measurement (s|OFF|l|0) as sent to the IoT Broker can be seen on the device monitor page. Measurements will be sent to the IoT Agent as the state changes. This example shows how a real IoT Agent would send an Ultralight command to a Smart Door to unlock the door. The Smart Door has already supplied an endpoint /iot/door001 where it is listening for commands. The body of the request consists of the id of the device (urn:ngsi-ld:Door:001) as held in the Context Broker and the name of the command (unlock) to invoke on the device. Once the Smart Door is unlocked, it will automatically open and close as customers enter. The changes of state are actively reported to the IoT Broker, and the state of the Smart Door can be seen on the device monitor page. The Motion Sensor within the store is not an actuator - it does not respond to commands, however it does actively measure the number of customers passing by. If the door is unlocked, the Motion Sensor will detect movement and send Ultralight measurements back up to the IoT Broker. The Northbound HTTP requests generated by the Motion Sensor can be also viewed on the device monitor page. 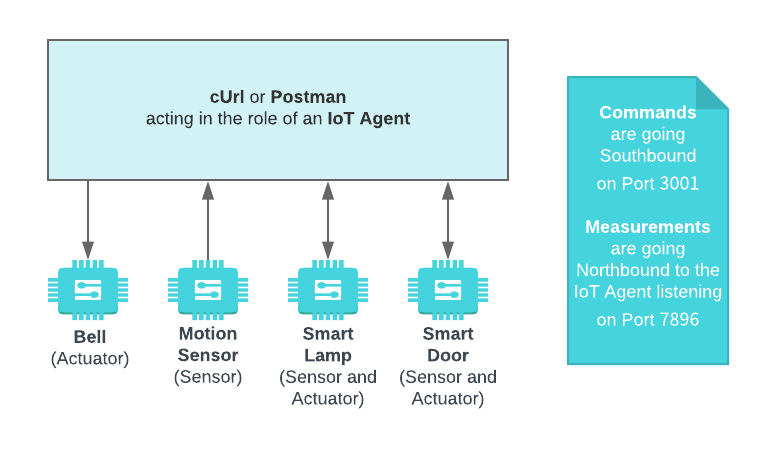 This example shows how a real IoT Agent would send a command to a Smart Door to open the door. The Smart Door has already supplied an endpoint /iot/door001 where it is listening for commands. The body of the request consists of the id of the device (urn:ngsi-ld:Door:001) as held in the Context Broker and the name of the command (open) to invoke on the device. The state of the Smart Door can be seen on the device monitor page. Customers may now enter and the Motion Sensor may pick up movement and send measurements to the IoT Broker. The Northbound HTTP requests generated by the Smart Door and the Motion Sensor can also be viewed on the device monitor page. This example shows how a real IoT Agent would send a command to a Smart Door to close the door. The Smart Door has already supplied an endpoint /iot/door001 where it is listening for commands. The body of the request consists of the id of the device (urn:ngsi-ld:Door:001) as held in the Context Broker and the name of the command (close) to invoke on the device. Since the door is currently unlocked, customers will continue to enter, and re-open the door themselves. If motion is detected, the Motion Sensor will send measurements to the IoT Broker. The Northbound HTTP requests generated by the Motion Sensor can also be viewed on the device monitor page. This example shows how a real IoT Agent would send an Ultralight command to a Smart Door to lock the door. The Smart Door has already supplied an endpoint /iot/door001 where it is listening for commands. The body of the request consists of the id of the device (urn:ngsi-ld:Door:001) as held in the Context Broker and the name of the command (lock) to invoke on the device. Once the door is locked, no further customers may enter. The Motion Sensor will report no further movement detected, the Smart Door cannot be opened manually and the Smart Lamp will slowly return to the ambient lighting level. The Northbound HTTP requests generated by the Smart Lamp can be viewed on the device monitor page.